Biancaniello’s current schedule is demanding: in addition to long hours bartending at the Roosevelt Hotel’s Library Bar several days a week (and his subsequent visits to farmers markets to source ingredients), he worked throughout last month’s Tales of the Cocktail, is featured in the September issue of Bon Appetit magazine, and has a two-day gig (August 26-27) coming up at Test Kitchen, where he’ll be guest bartending during chef Walter Manzke’s run alongside resident mixologists Julian Cox and Joel Black. I stopped by the Library Bar recently to meet Dragos Axinte, the founder of Novo Fogo Organic Cachaça, who was in town to introduce his excellent spirit to our city’s finest. While I waited for Axinte at the bar, Biancaniello got me started with a sample of Basil Hayden’s Bourbon, which he’d infused with Black Mission figs. 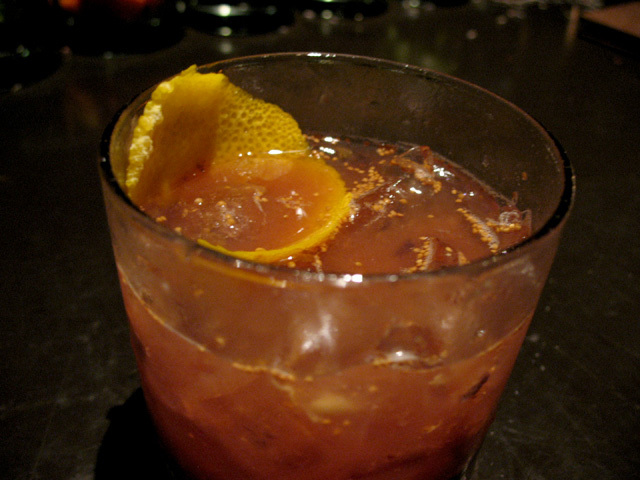 The lightly spiced, peppery bourbon now had a vibrant color and a flavor profile enhanced by the distinctly sweet figs. It was a spirited amuse-bouche that only hinted at what was to follow. Meanwhile, Biancaniello served a couple of guests two of his signature cocktails: the Honey Kumquat Pisco Sour and the Kentucky Bubble Bath. The latter (made with Bulleit Bourbon, housemade lavender syrup and a Cynar float) was the cocktail Biancaniello was referring to in his Facebook update. Biancaniello showcased two Heaven Hill favorites in an innovative cocktail he called the Mad Men, created for a private event hosted by a cast member of the acclaimed drama. Biancaniello began with a Quaffer, an hourglass-shaped glass designed to hold a shot and a chaser in a single vessel. The bottom (2.5 oz) features an Old Fashioned with Elijah Craig 12-Year Old, while a Rittenhouse 100 Sazerac fills the top half (1 oz). 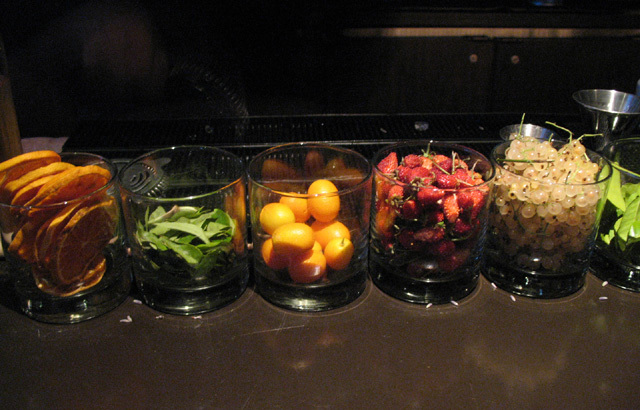 A Luxardo maraschino cherry separates the two mini-cocktails. 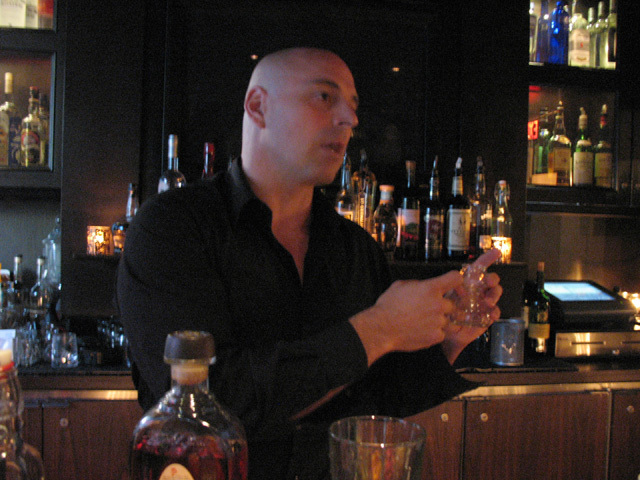 Matthew Biancaniello explains his Mad Men cocktail to guests. Next up was Un Caffè Va Bene, made with 2 oz Cynar, 3/4 oz crème de cassis, and 1 oz espresso. Biancaniello feels it’s a drink you can enjoy at any time of the day, which is remarkable considering the distinctively flavored Cynar is the featured ingredient. While I’m sure I would enjoy having one at breakfast or lunch, Un Caffè Va Bene did strike me as the perfect after dinner cocktail: served in a flute, balanced and rich without being cloyingly sweet. Biancaniello says he loves Cynar (that makes two of us) and enjoys working with the “magical” combination of Cynar and crème de cassis, swapping out the third ingredient to create a variety of cocktails. 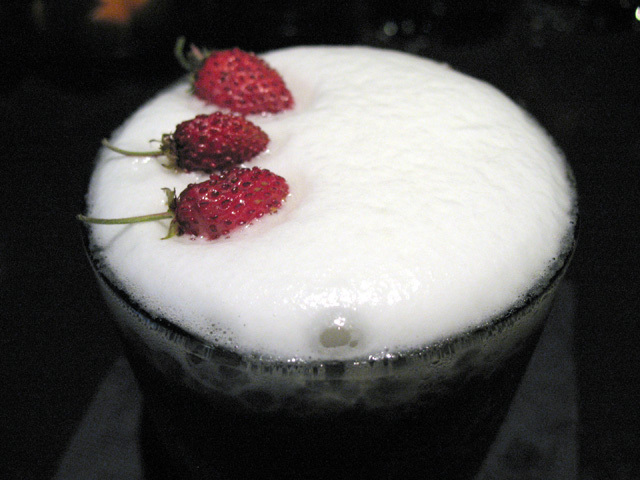 Then came the Last Tango in Modena: Hendrick’s Gin, 25-year balsamic vinegar, and frais des bois (wild strawberries). 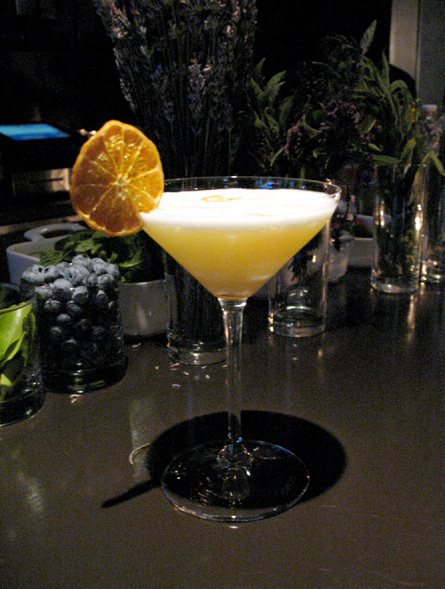 Biancaniello uses an iSi charger to top the drink with a foam made from St. Germain Elderflower, egg white, and lime juice. Biancaniello said that, of all of his cocktails (303 and counting), he’s the proudest of the Last Tango in Modena: it’s his most original and not based on anything else. 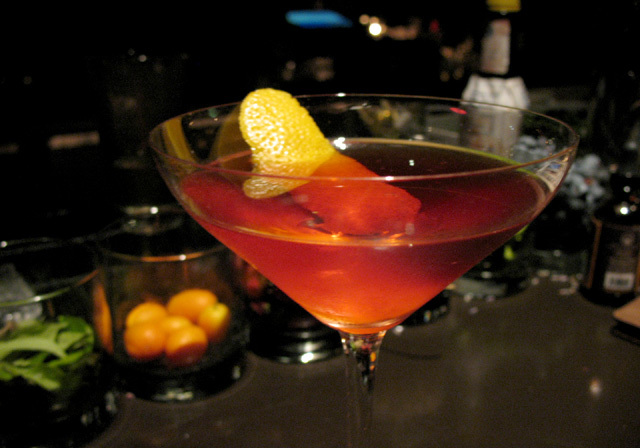 It’s a cocktail that caught the eye of Gayot, which recently named the Last Tango one of the Top Ten Cocktails in the U.S. When Biancaniello serves the Last Tango he insists that guests don’t use a straw, so they can fully appreciate the texture and flavors. It’s a superb creation, delicately balanced from the aromatic foam to the cucumber-infused gin, the sweetness of the strawberries, and the sweet/sour depth of the aged balsamic. 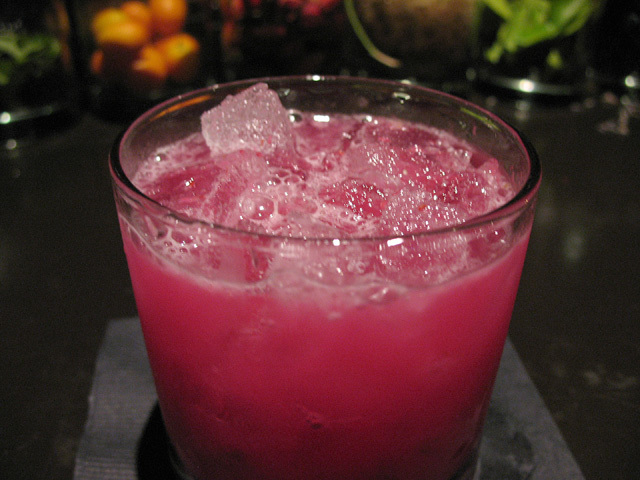 Biancaniello next presented his Breeder’s Cup, a Gordon’s Cup variation with Hendrick’s, cucumber, beet horseradish, lime and agave nectar, topped with salt. The cocktail’s brilliant hue serves notice that this is a drink with a kick: it’s a refresher on first sip thanks to the gin and cucumber, but there’s a nostril-clearing hit of horseradish on the finish. An Old Fashioned with Novo Fogo Gold. Axinte had arrived at this point, and after introductions and a tasting of the Novo Fogo Silver and Gold, Biancaniello’s creative juices were flowing and he served us a couple of cachaça-based cocktails. First up was an Old Fashioned featuring the Novo Fogo Gold, muddled figs, cinnamon, a sugar cube, and Bittermens Xocolatl Mole Bitters. It was a great riff on a classic, and before we were done Biancaniello had sold seven of them (to other patrons, of course). Brazilian Negroni with Novo Fogo Silver. Then it was the Brazilian Negroni, made with 1 oz Novo Fogo Silver, 1 oz Carpano Antica, .5 oz Aperol and .5 oz Campari, garnished with an orange peel. Another winner, one of the best drinks of the entire evening, and the one that got the most responses from my Twitter feed of the session. 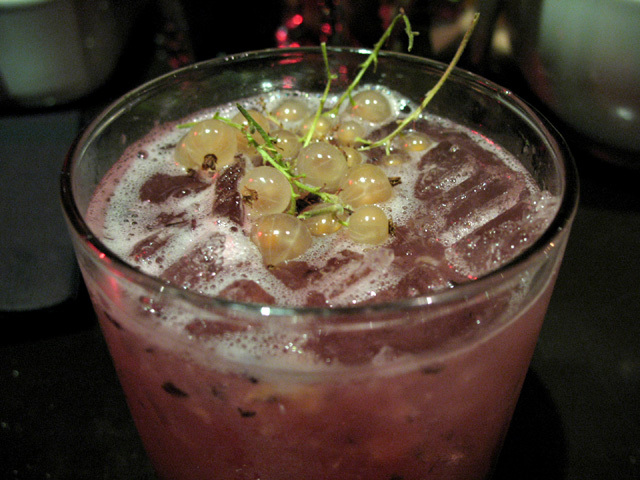 Next was the Shiso Gimlet, made with Hendrick’s, lime juice, agave nectar and shiso leaves, garnished with white currants. The earthy shiso, with its hint of anise, adds depth to a simple yet enjoyable take on a classic. 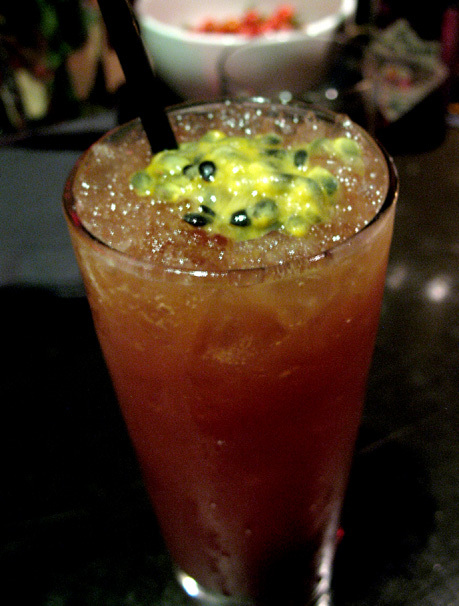 My final cocktail was The Root of It All, made with 2 oz ROOT, 3/4 oz crème de cassis, four small passion fruits, and topped with a dollop of passion fruit. Biancaniello was actually saving this drink to make for a local reporter, but because he/she was a no-show, Biancaniello was kind enough to make it for me instead. Hopefully the reporter is able to reschedule, because The Root of It All is a wonderful cocktail that once again showcases Biancaniello’s command of his ingredients. What was originally planned to be a round of drinks and a short stay somehow turned into several hours of cocktails and flowing conversation that lasted well into the evening. It was by far one of the most memorable and enjoyable nights out I’ve had in quite some time.